Japanese Aircraft Carrier Hiyo at anchor. The Imperial Japanese Navy operated two aircraft carriers of the Hiyo-class (Hiyō-gata kōkūbokan). The names of these ships are Hiyo and Junyo. However, they were not originally planned as aircraft carrier. Instead, they were laid down as passenger ships. But due to the start of the WW2, they were bought by the Imperial Japanese Navy, even before they were finished. the Junyo was completed in May 1942 and participated in major naval combats in the Pacific War, including invasion of the Aleutian Islands. The Hiyo and Junyo also cooperate together during the Guadalcanal Campaign. However, both embarked aircraft squadrons were often operating from land bases. 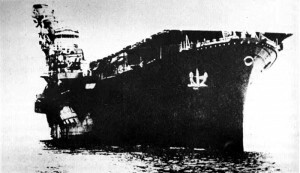 The carrier Hiyō was torpedoed in June 1943 and Junyō in November, which led to several in months of repairs for both ships. Most of the time after their repairs was spend in training and ferrying aircrafts. The final fate of the Hiyo was related to a gasoline vapor explosion after being hit by a torpedo during the battle of the Philippine Sea on summer 1944. The Junyo did not have assigned an embarked squadron by late 1944 and was mainly used as transport. She was also hit by a torpedo in December 1944 but the repairs were not worth the cost therefore they were abandoned. After the war was over in 1946-1947, she was broken up.